We use easy-lube hubs which ease the repacking of wheel bearings by eliminating the need for disassembly and are backed by a 1-year warranty. A factory molded plug together wiring harness is used to eliminate the need for wire splices which often corrode and lead to wiring shorts. It is also poly loomed where exposed and carefully routed outside the fender well to prevent wires from being damaged by debris thrown up from the tire. 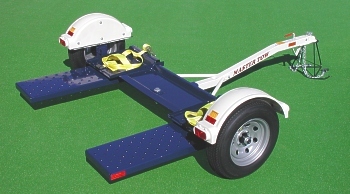 10,000 pound rated ratchets and adjustable straps securely fasten most 13” through 16” tires and wheels.